with Visionary Leader Jan Jorgensen Cercone and friends Watch the Video of our 2015 Trip!! St. Sarah Gypsy Festival…walk to the Sea Ritual…learn how the Divine feminine planted seeds for us that are now blooming, through you! We are right in the middle of the Cathar Country, where the Divine Feminine flourished and where the women brought Divine Energies to heal, guide and educate people. Our Local guide, Jaap, knows every church and grotto and where Mary Magdalene herself led healing. We are minutes from the Famous little hamlet where the Da Vinci Code was filmed and the mystery of the Divine Feminine became a house-hold concept. We pay as we go…appox $1,800 for for Rooming, meals and activities. Plane fare not included. 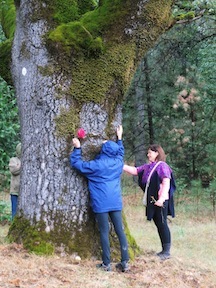 Reserve your place now and learn more about our trip by contacting Jan at 707-206-5068. See Registration Link below! To be able to share just two days was a gift for me. To be with women who are so gifted and dedicated to their individual goals in the light is completely over whelming and I savored every moment of the days we shared. I have never considered myself a leader or claimed that position in life. If it means that I am to be someone who might lead in any way I of course. will be ready to accept the challenge. Your leadership is an inspiration to anyone who follows the path of light. 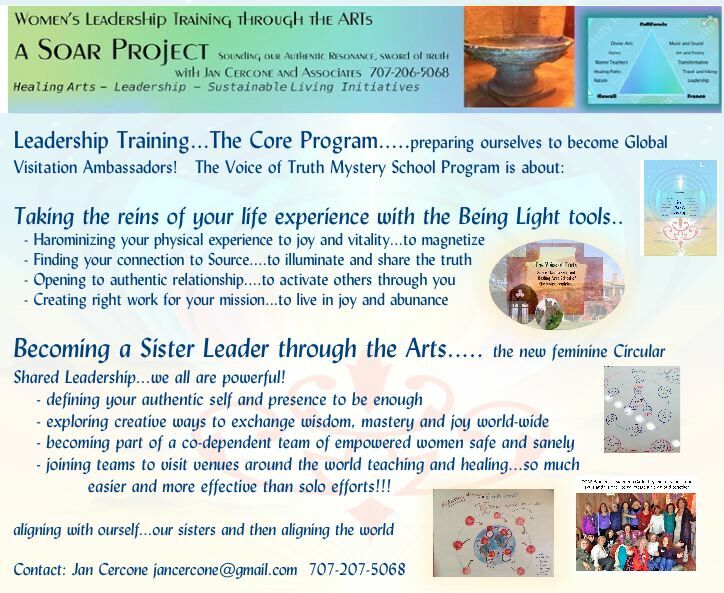 Leadership thru the Lens of the Feminine, Divine Healing Arts and Energy Instruction, Yoga, Hiking. Day trips to Churches and Divine feminine areas of interest. Facilitators: Jan Cercone, Jaap Remeijer. 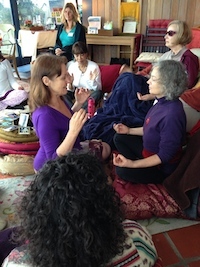 The SOAR Training: Meditation, Awakening Exercises to instill and embody your highest Vibrational profile. 12 days of Joy away from your usual routine. Be immersed, and bathed with spirit of the Divine Feminine! Arrive Toulouse. We will get everyone from the Toulouse airport to the Hotel in Toulouse..a historical and beautiful roof-top town with a central canal, cafes. Dinner together at 8pm. Get a good nights rest. Take a look at our trip itinerary for updates. Our first official gathering, we will meet in the Lobby to head for breakfast and review the days plans and begin to meet our fellow group travelers. A lovely countryside drive to Les Labadous with a stop at a French grocery to stock up on foods we like for between meals, our favorite foods. Stop for snacks, coffee. Upon Arrival we will unpack, have some free time to stretch before we meet with Dominique LaCroix and Gordon Lent…author, creators, engineers of the Divine Plan living in France!! 6pm French dinner in Les Labadous dining room. We skip Breakfast….We leave quite early with either bag lunches or stop enroute for an early lunch to attend The Famous Wonderful Gypsy Festival to honor St. Sarah. An exciting day in the crowds as they Celebrate Queen of the Gypsies with a walk to the Sea led by Sarah on 6 white horses… Like Carnivale. Little dark Sarah was the daughter of Mary Magdalene. Dinner on your own for the greatest culinary experience in little alleys with live music. Visit the Church crypt, enjoy church ritual..shopping, people watching AND gypsy music. 10pm Sharp! Leave via our vehicles, from our pre-set meeting place to return to Les Labadous. 7:00 Morning Yoga and fresh air stretch, mini hike around Les Labadous…you choose. Bring your own snacks, We visit the Da Vinci Code fame Village and have rose ice cream and coffee at Saniere’s garden under the fig trees. Explore. Walk the winding Roman road (10 min) or ride home. 7:15 am Yoga, breathing, meditation up at the plateau below Renne le Chateau. 9:00 Living within our OWN Divine Energy field. 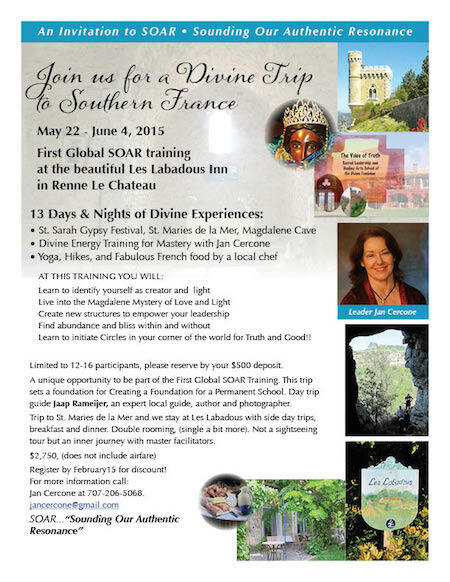 Leave for a Day outing…, Renne le Bains, Alet les Bains with local Shaman and Global Healer Diana Allen of Esperaza. for personal, community and global change. Discussion and experiential. With Special guest David…Sound Healer extraordinaire!! a beautiful church along the way…..(moderate hike). Dinner out at_Bishops House? to be decided!! Relax upon return for a free evening. This is where she performed healing on women. 1-3 Potluck Picnic lunch we create from our provisions. 3p- A Visit to local Stephen Marcus’s home….a restored 17th Century Winery…why he was drawn to this hamlet from his city home! 8:00 The SOAR program and you…. how to share you!! … Presence…..Expressive Arts Processes and the Ambassador Program and special local guest to Meet and share their wisdom! Get Sack lunches and take off for the Visit to the Perillos Caves….made of crystal, it is the home of the Christ’s family when in transit, a very special holy place. We will stop at sacred places along the way. 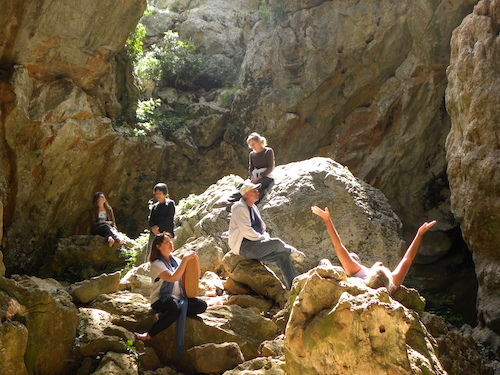 Beautiful scenery and meditation in the caves make this a very special day. We head off to the deep caves of Perillos, where the Holy Family took refuge, and work with sound, ritual and our voices to heal and expand the truth in all dimensions. We work with alignment in our work and mission. Some say that Jesus and Joseph of Arimathea are buried there. We visit Opoul Castle and Tautavel. and have dinner out. As an alternative you may choose to have a quiet day at Les Labadous. 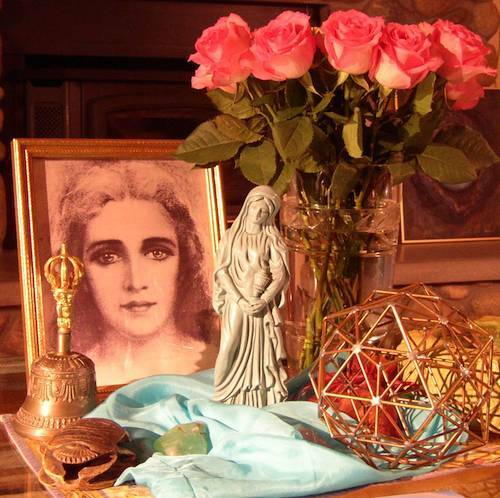 9:30 Optional Trip to local site… to learn more about the Divine Feminine and Magdalene legacy…via Jaaps wonderful guidance. Perhaps mini lemon pies? 2pm Return to Les Labadous.. support for preparing your Ambassador Vitale…or statement..who you are, what you bring and how. Make a chart, song, poem..…an artistic rendering of this. 7:30 Present your Statements..work in Small groups…discuss how to create Community Circles anywhere. 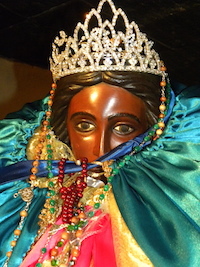 Off to the Esperanza Farmers Market and Church…a riverside sacred town. new and old friends. Good time for personal sessions, exchanges and plan making. 9:00 SOAR meditations, nature walk. Free day to explore. Or we create a group Option ………………………………. 10am a stop at Carcassone before visiting a Healing Farm in Toulouse… Visit, relax. Get you to the airport very early…Drop-offs per agreements. How to Text Jan in France: 707-206-5068 is my cell. Add 001 before the phone number. To call home, be sure to add the 00 and then the 1 for USA. So, 001 and then the number. First, thank you for generating such a wonderful experience for everyone by all that you do. There is no better host/ess. I see all that you bring together from facility to program to furnishings to artful arrangement to flyers and handouts to food to introductions to music and song to treatment to course material to connections. You are truly amazing! And to top it all off you make it look effortless, even when a glitch comes up and needs fixing. And you are gracious to all your guests from presenters to attendees. You are a marvel to behold in your element like that. Gifted in ways most people couldn’t even guess beneath the beauty and joy of your singing and your smile. It was a treat for me to experience this. We are the daughters of the Light…and promised to bring the Divine Back to earth!! 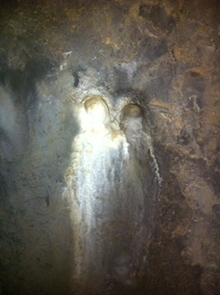 I turned the corner in the Grotto and there she was…and the iphone made her gleam in the flash. Limestone colorations became the Magdalene and her daughter Sarah, with a veil. A very important image.